A few weeks ago the cool kids at FOREO invited me and James down to a FOREO ISSA Mikro Event. Foreo makes a wide range of skin care and oral care products. This event focused on the ISSA Mikro and Mini toothbrush ranges for children. Leading cosmetic dentist Dr Mark Hughes was also at the event to give the kids and parents some tips and guidance on how best to look after their teeth. So what are the FOREO ISSA Mikro and FOREO ISSA Mini? 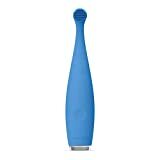 Put simply, the FOREO ISSA Mikro and FOREO ISSA Mini are electric toothbrushes designed for children. The ISS Mikro is designed for ages 0-5 years and the ISSA Mini is design for ages 5+. These aren’t sketchy cheap and nasty toothbrushes, oh no – they are really good quality Sonic Pulse technology brushes. The Mikro and Mini pulse 6000 and 9000 times a minute respectively. The heads don’t have harsh bristles, they have bristles made from soft and flexible silicone bristles that don’t scratch tooth enamel or damage gum tissue. They are perfect for children’s softer tooth enamel and more sensitive gums. The battery takes an hour to charge and will last for 6 months before it needs charging again! Why are the FOREO ISSA Mikro and FOREO ISSA Mini so good? 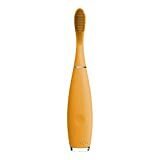 They are really well built, well designed, and perfect to get children in the routine of brushing for 2 minutes each time. The pulses pause every 30 seconds to let the child know that they need to move to a different part of their mouth. After 2 minutes is up, the brush stops and a cute little smiley face glows from within the handle. You can pick up cheaper electric toothbrushes for sure. However, so much thought has gone into making the FOREO ISSA Mikro and FOREO ISSA Mini work effectively and hygienically. They aren’t super cheap, but they are designed to last. I’m going to write up a full review of the FOREO ISSA Mini that James got at the event in due course, but we’re very happy so far! What did we learn at the FOREO ISSA Mikro Event? Dr Mark Hughes was lovely and spent a lot of time chatting with James about how best to care for his teeth. Dr Mark told him that it’s best to brush BEFORE breakfast (something I didn’t know). So now, when James gets up in the morning, he’s straight into the bathroom to brush his teeth. They had giant sets of teeth, and Dr Mark showed James how he should gently brush each tooth with a circular motion all over. He’s really listened to the advice, and because of the timer in his Foreo ISSA Mini, he’s brushing for a full 2 minutes each time now too! After spending some time with Dr Mark, we played with some Play-Doh ‘Dentist’ sets and Foreo had laid on a few games for the children to win some prizes for their goodie bag. I don’t go to many events these days but the FOREO ISSA Mikro Event was one of the best I’ve ever attended. Both of us had a fantastic time, thank you to FOREO for the invite! Where can I get a FOREO ISSA Mikro and FOREO ISSA Mini? You can get them from the FOREO website here and here. Or, they are available on Amazon – I’ve made a list of the complete ranges – click here for that. Disclaimer – FOREO gifted us a FOREO Issa Mini and covered our travel expenses to the event – all opinions are my own.